**Disclosure: We received products in order to facilitate a review and recipe. No compensation was received. All opinions are 100% my own. While shopping at the grocery store and picking up a few things for the kitchen, I am sure that you often see cans of Red Gold. Well, did you know that Red Gold is from Indiana? 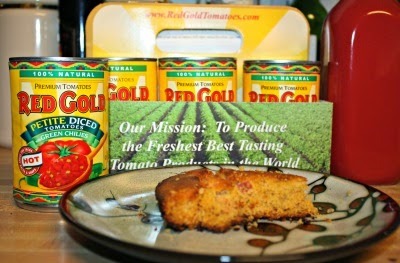 Red Gold is a family company launched in 1942 that has been packing Midwest tomatoes ever since. Pretty neat, huh? 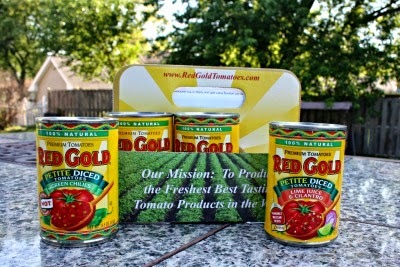 Well, this summer Red Gold is holding its second Summer Grilling Party over on Facebook with recipes and giveaways! Many winners will win a festive Red Gold apron and one lucky winner will win a Big Green Egg Grill and a Red Gold grill pack! Awesome! The giveaway is going on through July 23! Red Gold did provide me with some delightful tomatoes to try out--- Red Gold Diced & Green Chilies, Chili Ready, Basil Garlic and Oregano, Lime & Cilantro and Diced Tomatoes. Bet you didn't know they had so many varieties! The Red Gold Diced & Green Chilies inspired me to make an amped up cornbread. I have seen a number of spicy cornbread recipes in the past but have never tried one myself. 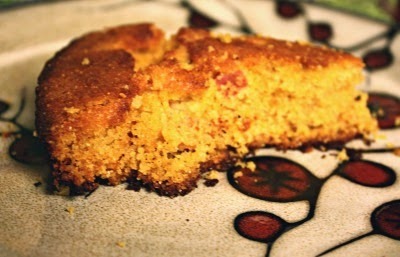 This week seemed like the perfect opportunity and the result was a lovely cornbread with a nice bit of edge! Preheat your oven to 450. Melt butter in an iron skillet in the oven as it warms. Remove the skillet once the butter has melted. Be sure that the butter has coated the sides. Next, combine the cornmeal, salt and baking soda. Then, stir in the egg white, milk, EVO, tomatoes and honey. **You can add a bit more of the tomatoes if you like. I held off because these tomatoes are surprisingly spicy. ** Pour batter into the skillet and place in the oven, baking for 25-30 minutes. The top of the cornbread will be lightly brown and the middle firm to touch. Then, turn the cornbread out onto a serving platter. Head over to Red Gold for some more recipe fun and to enter the contest!